"Here's a common problem with a fun solution. I wrote it for the 220S, but it may apply to other pontons too." You've got a 220S ponton (original head), and it leaves a small spot of oil each time you park, and you just can't find the leak, is that what's troubling you Bunky? It only seems to leak when the engine has been running, but it leaves the same size drop every time, under the carburetors. There isn't much oil present on the engine. If anything, there seems to be a slight film of oil on the generator, especially near the terminals and wiring. You may have a leaking timing chain tensioner. You've got a 220S ponton (original head), and it has a rattling noise coming from the engine, is that what's troubling you Bunky? It is present more or less at all times, but especially at idle. Oil may or may not be present (as above). You may have a leaking timing chain tensioner, or it may not be bled properly. You need to check and renew and bleed your timing chain tensioner. This job will cost about $25.00, and will take you about 2 additional hours, including "gee whiz" time. You should do this when you are already going to adjust your valves. Why not plan change your oil at the same time? 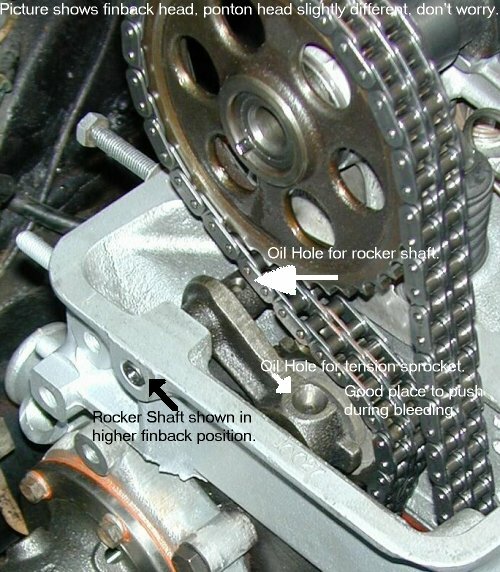 The timing chain tensioner is the 27mm "nut" sticking out of the engine above the generator. The cost stated includes the cost of buying a 27mm socket, since you probably do not have one. The timing chain tensioner is a very stout fitting, sealed by an aluminum sealing ring. I just torqued down on it harder and harder with the socket until the leak went away. I needed the 27mm socket, and about 80 ft-lb of torque (I never measured it, but I used the big wrench). However, I already knew the condition of my tensioner. Perhaps you don't. In this case, you might want to follow the following procedure. Before you start, it would be nice to have access to a blasting unit. This part cleans up nicely once removed. But perhaps you don't have one. No matter. Your tensioner will just not look as nice as some others. Pretty minor in the scheme of things. Also before you start, you should acquire a new sealing ring. It measures ID=18mm, OD=22mm thickness 1.30mm (not critical, could be slightly more or less.). It's made out of aluminum, a soft metal, and it's similar to the sealing ring for the oil drain plug found on many cars. A ring which measures as described should do the job. Find it at McParts (your local parts store), or the official MB part number for the gasket between chain tensioner and cylinder head is: 180 052 04 80 and the MB part number for the sealing ring is: A 18 x 22 DIN 7603 Al. I would just make my own, or use the old one over. (That's what I did this time). Next, to do this job, you will have to have the head cover off. So do this at a time when you are already adjusting the valves. But do this part before you actually adjust the valves. You will end up with a tight chain, which will assist you during valve adjustment. First, just for kicks, see how much tension your chain was under to start with. find the lever arm which connects the chain tensioner sprocket to the pivot shaft. Push straight down with your fingers on the arm near the chain tensioner wheel. Can you move it? A lot? How hard is it to displace? Go ahead and pump it a few times. Does it get firmer, or does it stay easy to push? Remember all these things, like how hard it was to push and if it got firmer. When you're done, you'll be able to compare. Now get to work, just take the two nuts off on either side of the tensioner, and the tensioner will slide right out of the block. No need to do anything inside the head. Have some rags ready, because you will have a bunch of oil pour out of the head. Clean up the chain tensioner a little bit, and then pump it a few times in your hand. You will spray a little oil, so be careful. See if you can get the 27mm nut off. You may have to put it in a vise, or use a pipe wrench, or maybe bolt it back onto the head to get it off. If so, just get it started, then take the tensioner back out and take it apart in your hand. Out will fall, in short order, the sealing ring, the spring and the piston itself. Take some time here and clean them up as best you can. Use Gunk, carb cleaner and so forth. Reassemble the parts in your hand and dry. Then hold it in your hand and try to compress the piston, it should move freely, but be kind of stiff. I can compress mine with one finger while holding the tensioner in the palm of my hand. Your mileage may vary. Now disassemble again and pay attention to the condition of the sealing ring. Is it smooth, round, no pits, etc? Is it crushed? Consider replacing it. If you have replaced the tensioner at some point in time, the newer tensioners have a round rubber gasket. If yours has this, don't use the metal sealing ring - the rubber gasket replaces the metal one. However the metal sealing rings work well, and may be more durable. If you have a metal sealing ring, just like on the oil drain plug of most cars, continue to use it. If you need to replace it, replace it with another metal sealing ring. This should be available at McParts, as mentioned above. Assemble again, and you are done. 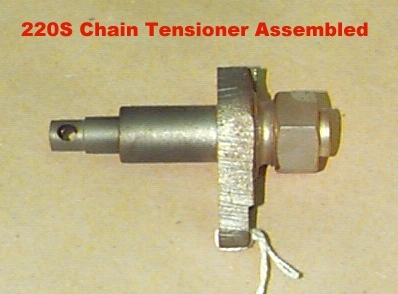 Use a couple drops of oil inside and then shake the tensioner once assembled. Consider torqueing the sealing bolt down on the vise before you put it in the car. Now bolt the chain tensioner back into the head. Pay attention to the gasket that came out. It has a funny shape, including one being split around one bolt. Replace it if necessary (I didn't). Now comes the fun part, bleeding the chain tensioner. Just like with brakes, it's the most critical part of the job. The perfect scenario here is if you are changing your oil and have already drained it. You are going to be pouring a lot of oil into the head, and some spills into the crankcase, so if it's already empty you can't overfill it. Now get started. Remember what the tensioner felt like before, when you were pushing on the lever arm? Try it now. How does it feel? Go ahead and pump it. Whichever hand you have been pumping it with, continue pumping. The next part happens quick so read this paragraph first before you continue. As you pump the tensioner, with the other hand, begin to fill the reservoir with motor oil. If it's a cold day, feel free to warm the oil bottle before use. This may make the process a little easier. In any event, keep pumping and keep filling the reservoir. 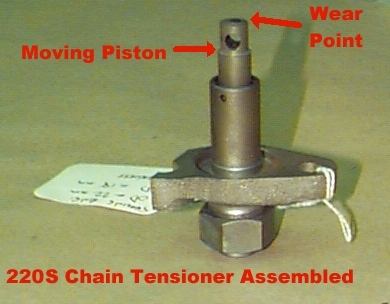 The tensioner will draw oil as it is released, so be sure to keep the reservoir full (overflowing is best) at that point. You will feel the tensioner begin to get much harder to depress on the second real stroke. By the fourth or fifth stroke you may not be able to depress it at all. Use a tool like a screwdriver to push if you want a little help. By all means keep the oil reservoir overflowing at all times while you pump. That's why we started by draining the oil. Remember to put the other 4 quarts of oil in before you start the engine!